A letter written by Sidonie Fery when she was ten-years-old washed ashore during Hurricane Sandy. She tragically passed away three years earlier. Sidonie Fery was ten-years-old when she tossed a message in a bottle in to the waters of the Great South Bay. That same message finally reached land a decade later after Hurricane Sandy slammed the east coast. FEMA worker, Garrett Rivers, found the message in a green ginger-ale bottle that only caught his eye because it looked old. When he opened the bottle he found the letter with a number attached to it. Inside the letter said “Be good to yourself, dude!” A quote from her favorite movie Bill & Ted’s Excellent Adventure. Patchogue village worker, Brian Waldron, called the number on the back and the woman who answered was Mimi Fery, Sidonie Fery’s mother in Manhattan. It turns out Sidonie Fery was killed three years earlier while at a boarding school in Switzerland. “I came home and there was a message on the phone it says, "Oh yeah we found a bottle on the beach." I could not believe it was a message from my daughter who had passed away,” Said Mimi Fery in an interview with 1010 WINS. "I cannot tell you how unbelievable it is. I never changed my number. I’ve lived here since 1977. If I didn’t have a landline I’d never get this call." A plaque honoring Sidonie Fery was put on a rock of the Patchogue Long Island Beach Club where her letter was discovered. On the plaque is a picture of her, the Bill & Ted quote, the date the bottle was found, and sentimental words paying tribute to her memory that says, “I learned that even though someone is very small they may have a big heart.” Her artwork is now being sold on coffee mugs to raise money for young artists in Patchogue. The message from a movie about time travel, traveled time itself and luckily landed on the beach for the workers to find. The bottle floated two miles westward to the Patchogue seashore. It was caught between broken docks, boating gear, and sea trash. The lid of the bottle was damaged and water somehow never found its way inside destroying the letter. Where to put the Beeyard? 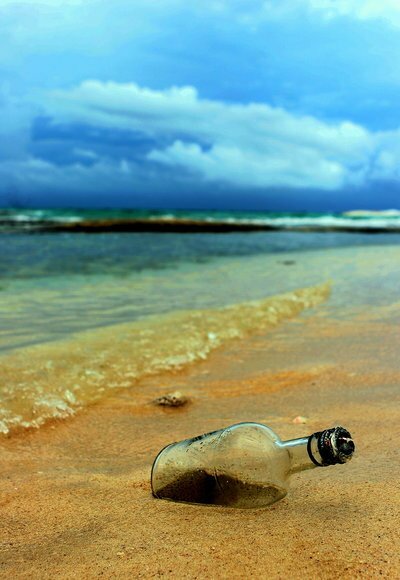 Subject: LongIsland.com - Your Name sent you Article details of "Patchogue Beach Where Message in a Bottle Washed Ashore During Sandy Honored"